Israeli by Day, American by Night: Celebrity? Not yet. The Virginia Jewish Life magazine interviewed me a few months back, and now it is in print. You can read the interview at their website. I really don't like the editing job they did (i.e. none), but no worries. Pretty neat though, right? Click on this link to see my ugly mug and read the interview. I don't know how long that link will work, so let me know if it goes dead! Daniel Brothers, 23, is from Elkton, a rural community in the Shenandoah Valley. In 2005, he took his first trip to Israel with Birthright, followed by an internship at The Jerusalem Center for Public Affairs, a political think-tank run by Dore Gold, the former Israeli Ambassador to the United Nations. He studied abroad in Israel at Tel Aviv University in 2006, and spent a few months in Aish HaTorah Yeshivah, in the Old City of Jerusalem. 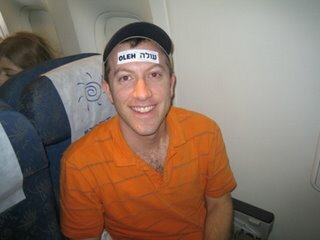 After graduating from The College of William & Mary in 2007 with a degree in Government, he made aliyah (emigrated) to Israel in September, 2007. He is currently studying in Ulpan Etzion, after which he hopes to join the Golani Brigade of the Israel Defense Forces. Where are you living in Israel? I live in a very Mizrachi, Sephardi, neighborhood in Jerusalem called Tzomet Pat. Before I made aliyah I was going to move to Haifa, because there are very few Anglos (native English speakers) there, which is the best way to learn Hebrew. Jerusalem has so many Americans, Canadians, and British, that sometimes it’s difficult to immerse yourself in Hebrew. I decided at the last minute to move to Jerusalem, however, because I have so many friends in the area. I grew up knowing that I was a Jew, but I never really had any idea that Zionism existed. I knew that Israel was a Jewish state, that Jews belonged to Israel and Israel belongs to Jews, but I did not realize that it had anything to do with me. Like so many kids, after I had my Bar Mitzvah I really started to think about Judaism on my own terms. Unfortunately, I came to the conclusion that there was no G-d, that Judaism was obsolete, and that I really didn’t want to have anything to do with it. In high school, however, I began to feel like there was something different about me, something that I did not share with my friends. I was the only kid in school to represent my faith, and I found myself embracing this distinction. I wanted to be different. I wanted to be identified with something, to be something instead of just another rural white guy. I started going back to synagogue with my mother and brother, researching Judaism on my own, and praying in a Reform, unstructured fashion. I was so excited to go to college and finally have Jewish friends, to meet Jews my own age. The only extracurricular activity I involved myself in for a long time was Hillel. I spent all my free time figuring out, on my own, Orthodox Judaism -- and it appealed to me on many levels. I eventually became an Orthodox Jew, and I found out that above all I am a Zionist. Do you have any family in Israel? I have none. This is admittedly the greatest difficulty in making the transition to Israel; not having the support of family. How did people react to your decision to move to Israel? “Are you crazy?” I think that most American non-Jews, or people that haven’t visited Israel, think that we walk down the street and see bombings and shootings left and right. The common reaction is one of surprise and even a little bit of condescension. People think I don’t know what I am doing, or that I am trying to prove something to someone. On the other hand, informed people treat me like a hero! I can’t tell you how many times I’ve heard, “I wish I would have done that.” Israelis either say, “You’re dumb. America is the place to be,” or “Welcome home.” The latter makes it all worth it. What kind of help did you get in making aliyah? There is an organization called Nefesh B’Nefesh that organizes every aspect of the process, and I would highly encourage anyone considering making aliyah to use their services. They take care of all the paperwork and red tape, and even fly everyone over on chartered El Al flights. Check out Nefeshbnefesh.org. I’m 7,000 miles away from my family, and we’re a tight-knit group, so I miss them terribly. On a daily basis, however, just dealing with the tough attitudes of Israelis is enough to stress me out. I’m a polite Southerner, not one of these rough Middle Easterners! What do you love most about Israel? I love the abundance, the sheer inability to find unkosher food in Jerusalem; I love how normal it is to walk around with a kippa; I love that this country is old, with a rich archaeological history; I love that everyone is Jewish and we don’t have to explain ourselves to anyone; I love that there is a synagogue on every street. Above all, I love that we speak a holy language here. We speak the same language that Abraham spoke, that the Patriarchs spoke, and that G-d spoke to Moshe in! What are the key differences between Israel and America? Everything! Our weeks run from Sunday to Thursday, with Friday and Saturday being our “weekend.” The country operates around Jewish holidays, which are institutionalized as national holidays; “American holidays” pass without even a word. Security is posted at every entrance to public and private spaces, and you can’t get in to anything without going through a metal detector. The most noticeable difference to a Virginian living here is the nature of the people. Israelis are known as sabras, which is a desert cactus-fruit. The outside of the sabra is tough and has sharp spikes, but once you get to the inside, it is soft and sweet. Like this cactus-fruit, Israelis are rough and tough on the outside, lacking the manners we take so seriously in the South, but once you break that tough shell they are sweeter than a Georgia peach. The same guy that butts in line and elbows you out of the way will invite you to his house for a Shabbat meal, even after he’s been a total jerk. These people are kind and sweet, but you would never know it. I want to have a solid, well paying job. I want to have a wife and children. I suppose the one unique goal I have is for my children to speak perfect, native Hebrew. I have no illusions that Israel and Syria are ever going to be friends, but I do feel like at some point we could have at least a lasting stalemate with the Arabs living in the West Bank and Gaza Strip. Right now we’re in the middle of some very serious political firestorms, and I am afraid that these issues that affect our peace, security, and relationships with the Arabs will never be resolved. I can’t imagine how we could ever rectify the conflict over Jerusalem and ownership of the “disputed territories,” but occasionally I feel a tinge of promise. My hope is for that promise to not be a pipe dream. All the dreams and reasons that I have for being here will be for naught if we aren’t able to exist in peace. I believe in the viability of the Jewish State, but can we afford to exist for hundreds of years while having to pay for such a necessary, oversized army? We are a small state, after all, and the hit on our economy from the military and security forces is tremendous. We absolutely must find a solution. Nice article, Danny. And mazal tov on your aliyah. Nice shirt, babe...haha, and nice article too! Call me so we can hang out tomorrow!!! I've been reading your blog for a little while and, since I'm making aliyah this month, it's been really insightful--not to mention entertaining! Keep up the good work! Well of course it's a nice shirt, my mom bought it! Sam, not creepy at all! I wish I got 100 comments like that a day. Some stuff can be a major hassle, and I've done it, so just shoot me a line anytime! Bhatzlacha, kol hakavod, vbaruch haba l'byitah! Congratulations Danny!! That is such an awesome article! I'm so proud of you and the sacrifices you've made to follow the Most High God. May He bless you for many years in the promised land! BTW lookin good in that picture bro, bet you have to beat the ladies off w/ a stick. Can't wait to come visit you someday in Israel! Are you coming back this summer to visit? I think I'll be around for a couple weeks. Not sure on even which month though, at this point. Follow your dreams, Danny. But remember, if you come to the mountain and don't at least say hi you will suffer the wrath of an old grey haired lady! Nice article. We are very proud of you!